Hey, there's nothing that says I can't talk about recent stuff, and I don't think enough people saw "Now You See Me" for it to pass unnoticed. 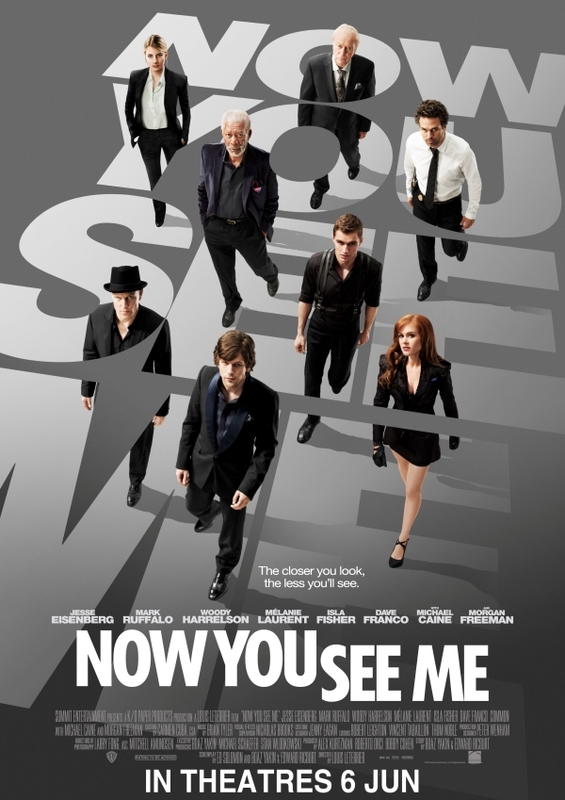 So, my love for a good heist film is certainly on record, and I enjoy stage magic as much as the next guy, which is part of why "Now You See Me" is so much better than you might expect. Part of why. The premise of the movie is that four magicians, used to working on their own, team up and start committing crimes in a theatrical way under the pseudonym "The Four Horsemen," and the FBI is trying to figure out not only how these magicians have turned into master thieves, but also why they're doing it, and how they can stop them. I don't want to talk too much about the movie itself, because that would spoil the fun of it all, but let me just tell you this - ensemble casts require a lot of great actors, each willing to play into their part and never try and steal the spotlight, and this cast does that wonderfully. Jesse Eisenberg plays the control freak, Isla Fisher the neo-punk, Woody Harrelson the mentalist, Dave Franco the rookie, Michael Caine the bankroll, Mark Ruffalo the fed, Melanie Laurent the international fed and Morgan goddamn Freeman as the debunker. Each of them gets their moment to shine, but the film is at its best when two or three of them are interplaying off of each other. There's a wonderful scene early on between Eisenberg and Ruffalo in an interrogation room that is just delightful to watch. The writing gives actors a chance to riff back and forth and build an easy rapport, and the film gives that space to breathe, letting the characters develop even as the story goes along. It's also not a film that force feeds things, letting the audience fill in some of the gaps from bits and pieces.